A few days after Día de los Muertos, graves at the Celaya cemetery were covered in cempazuchitl flowers. Since pre-Hispanic times, these bright orange marigolds have been part of Mexican altars honoring the dead. Witnessing the Day of the Dead altars and decorated gravestones, I saw firsthand the syncretism, or union of beliefs, in modern Mexican culture. The influences of Catholicism showed in the crosses and depictions of Jesus and the Virgin Mary, while the pre-Hispanic beliefs were prominent in the symbolic presence of the four elements – fire, represented by candles; air, by the papel picado (cut paper) moving in the wind; water held in small bowls; and earth, in the cempazuchitl flowers grown from the soil. I’d read about for Día de los Muertos many times in Spanish classes, but it wasn’t until I breathed the scent of cempazuchitl that I appreciated the beauty of the celebration. 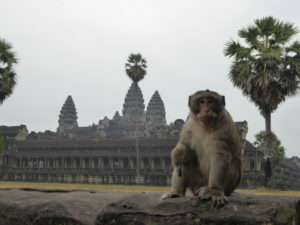 At six o’clock in the morning, when night became day and the morning haze began to clear over the majestic temple of Angkor Wat, the Macaque monkeys emerged from the surrounding jungle. I was only a passing tourist, but those Macaque monkeys have inhabited those mystic lands since before the time of the Khmer Empire. I left Angkor Wat that morning completely humbled: grateful for the opportunity to witness their home; hopeful for the preservation of their environment; and eager to share with the world the mysterious sensation of standing on the ruins of an ancient empire. 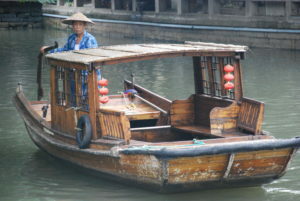 This man from Suzhou, China works tirelessly all day to shuttle tourists up and down the canal along a busy street of shops. Not only does he steer and propel the boat with the oar in the back, but he also tells stories about the area and sings a folk song for his passengers. The canals are narrow and there are many low pedestrian bridges that cause him and other boats to carefully maneuver through the channel. Boat drivers and tour guides work together to attract as many tourists as they can, and it seems like they have a small community of their own. The city of La Paz has areas of wealth and poverty, all of which can be seen from this popular method of public transportation — the teleférico. 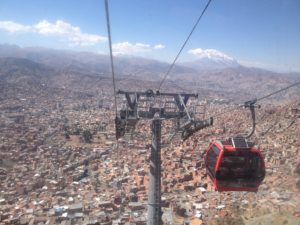 The teleférico has helped connect La Paz, which sits in the valley of a mountain, to the neighboring city of El Alto, which sits on the plateau of the mountain, a poorer city with a large indigenous population. Its green technology makes transportation cheaper and more accessible for all. This connection between up and down, new and old shows the growth that Bolivia is working towards, one step at a time. Bolivia is more than just a llama or women in Bowler hats, it is mountains and the nights spent in freezing weather in June, and a sprawling metropolis finding its footing in this new age. This year, almost 30 images were submitted to the contest. From used bookstores to creative writing courses, student Sophie Hilker takes in New Zealand during her 15-week study abroad experience. What does global citizenship really look like? Students share photos from around the planet trying to answer that question. Isabela Escalona and Emmet Hollingshead enriched their study abroad experience by volunteering. The four winners of this year's contest are shown here. Makaya Kekoa Resner '19 shares her reflections about the first few weeks of studying abroad in Geneva, Switzerland.